Contra is a game that should need no introduction. This classic side-scrolling shooter was in such demand when it was released that stores could scarcely keep it in stock. The game hails from a time when seemingly every pseudo-military themed action game had to feature a main character who was some sort of Rambo variant. 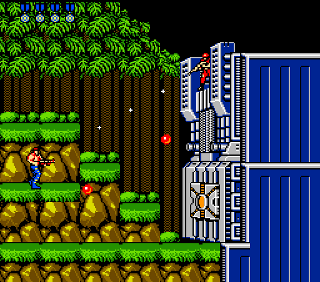 In Contra, commandos Bill and Lance fight through eight stages of jungle, mountain, and snow terrain along with some stages that have nearly inexplicable themes. As is standard fare for this sort of game, each stage culminates in a boss battle. Your standard weapon is a semi-automatic rifle, but the game features 4 weapon power-ups which include a machine gun, laser rifle, spread gun, and flame thrower. It isn’t possible to switch between weapons, and you lose your enhanced weapon when you either pick up a different one or are killed. The famous “Konami code” is most closely associated with Contra, as it is often used to overcome the game’s over-hyped difficulty. The game is challenging, but no more difficult than other games in the genre, and can certainly be mastered with practice. Possibly the game’s biggest draw is it’s two-player co-op mode, which allows two players to fight side-by-side. On top of just being a lot of fun, this also makes the game much easier because the number of enemies remains the same and the difficulty of the boss battles is tempered by the extra firepower. When one player’s game ends, they can continue to play by using the lives of the other player. When the second player’s game ends the game can be continued, in which case both players will resume with a full compliment of lives. Graphically the game is above-average, with detailed sprites, colorful backgrounds, and stars that twinkle. Where the game really shines presentation-wise is its audio. Konami games on the NES always had great music, and Contra is no exception. The first level’s background music is one of the most recognizable pieces of music – just as Contra is one of the most recognizable games – of the NES era, and is a must-play for the system. Buy Contra on GameGavel or Amazon. Tagged Action, Contra, Konami, NES, Nintendo, Review, Run & Gun. Bookmark the permalink.